2. Students who have passed the Secondary or equivalent examinations between 2015 and 2016 and any higher secondary examination of 2017 and 2018 from any of the Board of Education of Bangladesh. There are SSC and HSC both examination must passed Physics, Chemistry and Biology. Those who have passed SSC before 2014 will not be eligible for the application. 3. SSC / equivalent and HSC / equivalent examinations for all education programs in country and abroad will be at least 9.00. All tribal and non-tribal candidates of the Hill District must have at least 8.00 SSC / equivalent and HSC / equivalent examinations, but can not be alone under GPA 3.50 in any examination. 6. 0.25 Marks will be Deduct for Each Wrong Answer in Written Examination. 3. Admittedly, the names of the colleges themselves need to be arranged according to the order of their choice. Must have to know about college codes 51-59. Table-1 will be required to fill the admission test center. b. There are 2 option: 1. SSC/HSC/Alim passed and 2. O-Level passed. c. Select your option and click next. d. Question language, Applicant district, tribal quota, Eligible for freedom fighter quota, Present address and permanent address Be careful to write. Because something wrong will be canceled ‍application. e.Must be given a mobile number. After submitting the money, the SMS can be sent to the user's ID and password. Second cell phone number should be given in the second for contact if necessary. f. College choice option add your choice college. g. Type validation code and submit application. h. Upload your photo and signature. i. Finally color print this copy and collect USER ID. It's very important because This user Id give TeleTalk SMS to pay money. To Pay BDS Admission Fee Via Teletalk Mobile Phone. Please follow below the Instruction. 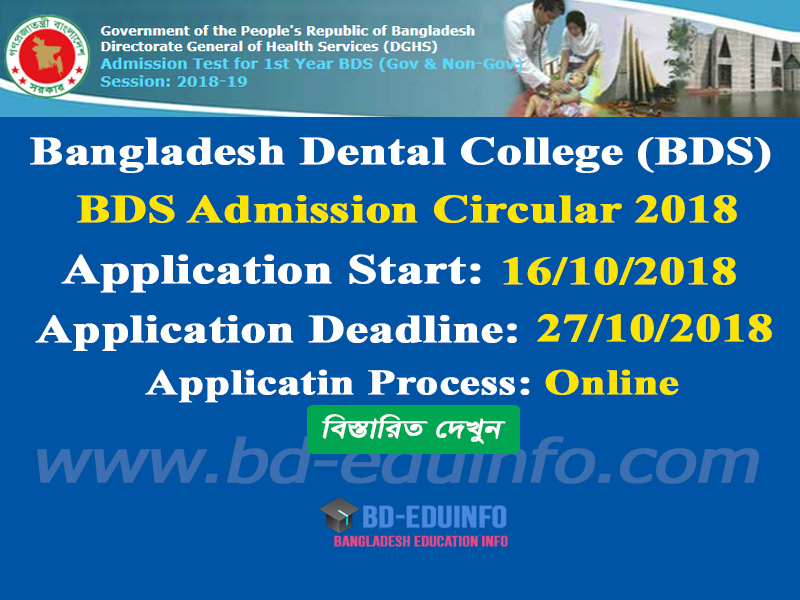 Bangladesh Dental College (BDS) 05 November 2017 to 08 November 2017 can Download Admit Card. You can download http://dghs.teletalk.com.bd/bds/index.php. 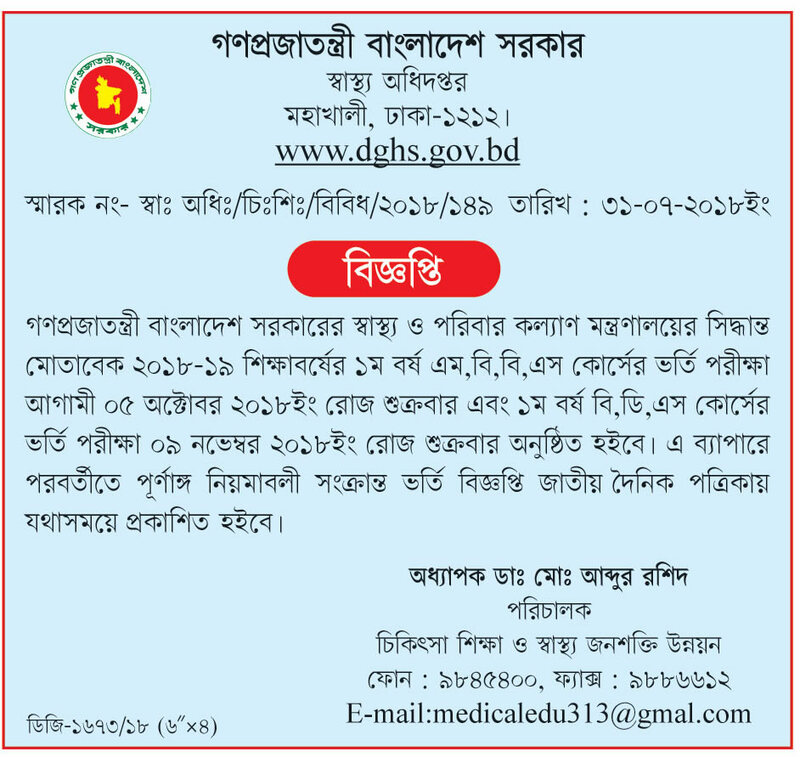 Bangladesh Dental College (BDS) Test Examination Seat Plan Admission authority will published http://www.dghs.gov.bd/index.php/en/ and Inform Applicant Mobile SMS. 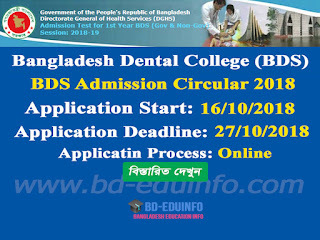 Bangladesh Dental College (BDS) will published Admission result their Official website http://www.dghs.gov.bd/index.php/en/. You can search their Admission Test Roll Number. Bangladesh Dental College (BDS) will published Admission waiting list result their Official website http://www.dghs.gov.bd/index.php/en/. You can search their Admission Test Roll Number. 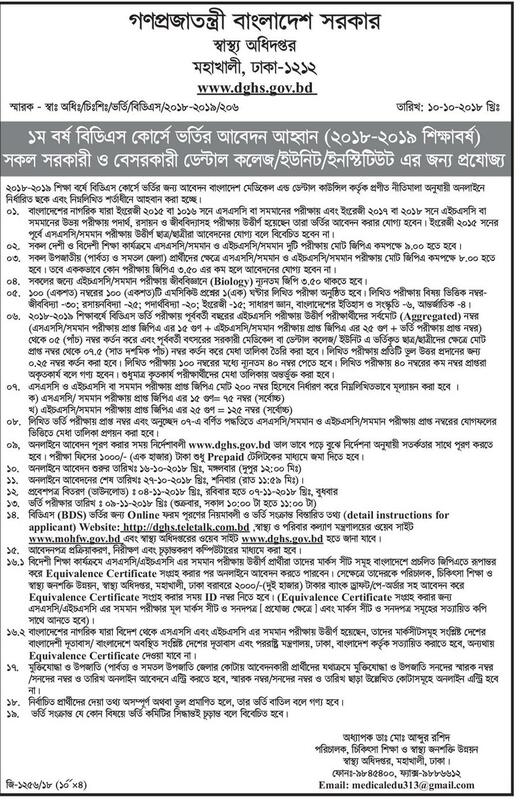 Tags: dghs.teletalk.com.bd, dghs teletalk com bd, bds index, Bangladesh Dental College (BDS), Bangladesh Dental College (BDS) Admission Circular 2018, Bangladesh Dental College (BDS) Admission Test Result 2017-2018, BDS Admission Circular, BDS Admission Notice, BDS Admit Card Download, BDS Seat Plan, BDS Admission Mark Distribution, Bangladesh Dental College (BDS) Admission Test Mark Distribution, BDS Admission Test Result, Bangladesh Dental College (BDS) Admission Waiting Test Result 2018-2019.
dghs.teletalk.com.bd, dghs teletalk com bd, bds index, Bangladesh Dental College (BDS), Bangladesh Dental College (BDS) Admission Circular 2018, Bangladesh Dental College (BDS) Admission Test Result 2017-2018, BDS Admission Circular, BDS Admission Notice, BDS Admit Card Download, BDS Seat Plan, BDS Admission Mark Distribution, Bangladesh Dental College (BDS) Admission Test Mark Distribution, BDS Admission Test Result, Bangladesh Dental College (BDS) Admission Waiting Test Result 2018-2019.